I don't typically like contemporary romances, but the cultural aspect of this novel appealed to me with the topic of arranged marriages. Dimple is a nerdy girl whose priorities aren't straight, according to her mom. She is frequently unkempt, not taking time to tame her wild hair or to wear some makeup. Dimple only cares about going to Stanford to study web development. Her mom hopes that she will find an "I.I.H." (Ideal Indian Husband), but that is the furthest thing from Dimple's mind. When Dimple finds out about a six-week summer program in web development at San Francisco State University, she is itching to go because she thinks that it will give her an advantage over the other students at Stanford in the Fall. She doesn't think her parents will allow her to go because the program costs $1,000 so she is shocked at how easily they agree! Little does she know that they have an ulterior motive. Her parents have actually been in touch with old friends of theirs, who have a son named Rishi and sent a picture of Dimple to him. He is interested in meeting her. 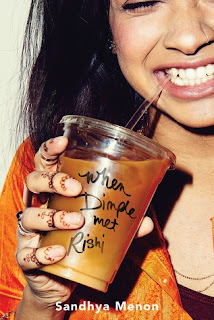 Rishi will be going to the SFSU summer program, and Dimple's parents hope that Dimple will hit things off with Rishi and that they can seal the deal on the arranged marriage. The problem is that Dimple is completely in the dark about the arrangement! When Dimple first meets Rishi, things get off on the wrong foot. When Rishi spills the beans about how their parents set up this meeting, Dimple fumes and can't believe her parents would do such a thing. Rishi offers to leave the program, but Dimple realizes that would be silly and they agree to hang out "as friends." However, Dimple finds herself liking Rishi more and more and he likes her just as she is...even without the kaajal (eyeliner) that her mom wishes that she would wear. This was such a cute romance that had me giggling at times. I get why Dimple would push back against what her parents want for her, but Rishi is hard to resist! He's sweet, responsible, and good husband material! Definitely an I.I.H. I was a little surprised at how quickly their whirlwind romance progressed, and I would have preferred things to move a bit more slowly. However, I do think they complemented each other nicely. I enjoyed how they both did things to advance each other's dreams. I really enjoyed this debut, and I'd definitely read something by this author again! I loved the dual narration from the points of view of both Dimple and Rishi, which I feel really added dimension to the characters. 4 stars!! It was really good, and you should put it on your TBR if you enjoy YA contemporary romances.